Conservative commentator Ben Shapiro claimed on a Dec. 3 episode of his podcast that, compared to Democrats, a greater percentage of Republicans voted for the Civil Rights Act of 1964. “More Republicans voted for the Civil Rights Act as a percentage than Democrats did,” he said on the show. While the landmark act received a majority of support from both parties, a greater percentage of Republicans voted in favor of the bill. Throughout the 1950s and ’60s, Republicans were generally more unified than Democrats in support of civil rights legislation, as many Southern Democrats voted in opposition. Shapiro made the claim in response to a question put forward by Franklin Foer in an article he wrote for The Atlantic. “What if the moderate Republicans of the late 1950s and early ’60s had aggressively owned the civil-rights agenda—and rendered the cause of racial justice a bipartisan concern?” asked Foer. “By the way, they did,” responded Shapiro. 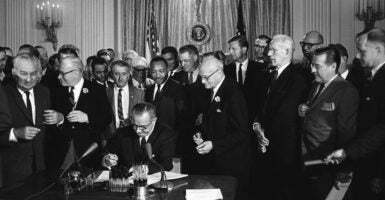 As the civil rights movement gained momentum in the 1950s and ’60s, the federal government passed a number of civil rights bills, four of which were named the Civil Rights Act. Of the four acts passed between 1957 and 1968, Republicans in both chambers of Congress voted in favor at a higher rate than Democrats in all but one case. Republicans often had fewer total votes in support than Democrats due to the substantial majorities Democrats held in both the House and Senate. During this period, the South was a Democratic stronghold that consistently resisted the civil rights movement. In 1956, many Southern members of Congress signed the “Southern Manifesto,” voicing their opposition to the ruling in the 1954 Supreme Court case Brown v. Board of Education, which declared that segregated public schools were unconstitutional. Democrats were geographically divided on matters of civil rights, while Republicans largely represented non-Southern states and were more unified. The most commonly cited of the Civil Rights Acts is the one passed in 1964. Shapiro told The Daily Caller News Foundation that he was referring to the 1964 act. Originally proposed in 1963 by former President John F. Kennedy, a Democrat, the bill ended segregation in public places and made employment discrimination illegal. The House passed the bill after 70 days of public hearings and testimony in a 290-130 vote. The bill received 152 “yea” votes from Democrats, or 60 percent of their party, and 138 votes from Republicans, or 78 percent of their party. In the Senate, the bill faced strong and organized opposition from Southern Democrats. Influential senators like Richard Russell, Strom Thurmond (who would soon switch to the Republican Party), Robert Byrd, William Fulbright, and Sam Ervin joined together to launch a filibuster that lasted for 57 days. After some changes were made to the bill and the filibuster ended, it passed the Senate with a 73-27 vote. About 82 percent of Republicans in the Senate voted for the bill, as did 69 percent of Democrats. The amended Senate bill was then sent back to the House where it passed with 76 percent support from Republicans and 60 percent support from Democrats. A number of powerful Democrats, such as President Lyndon B. Johnson and Senate Majority Leader Mike Mansfield, played important roles in getting the legislation passed. Prior to this, Congress had passed the Civil Rights Act of 1957, the first major civil rights legislation to be enacted in decades, which sought to protect the voting rights of black Americans. The bill passed the House in a 286-126 vote. Only 51 percent of Democrats voted in favor of the bill, or 119 of their 235 members, compared to 84 percent of Republicans, or 167 of their 199 members. After the filibuster ended and a number of changes had been made, the bill passed in a 72-18 vote. The bill received 43 of 46 Republican votes, or 93 percent, and 29 of 49 Democratic votes, or 59 percent. The Senate version was sent back to the House, where it was approved after amendment in a 279-97 vote (75 percent of Republicans voting in favor and 55 percent of Democrats). The Senate agreed to the amendment, with support from 80 percent of Republicans and 46 percent of Democrats. Republican President Dwight D. Eisenhower signed the bill into law on Sept. 9, 1957. Congress also passed the Civil Rights Act of 1960, which further addressed the voting rights of black Americans and established penalties for those who tried to prevent people from voting. The bill passed the House on a 311-109 vote that garnered support from the majority of both parties. Roughly 87 percent of Republicans voted in favor of the act, as did 64 percent of Democrats. In the Senate, the bill was then amended and passed with similar levels of support—83 percent of Republicans voted “yea” versus 65 percent of Democrats. The House approved the final bill in a 288-95 vote, with 81 percent of Republicans and 59 percent of Democrats in favor. Congress later passed the Civil Rights Act of 1968, also known as the Fair Housing Act. It initially passed the House in a 327-93 vote, with 68 percent support from Democrats and 87 percent support from Republicans. It then went to the Senate, where it was amended and voted upon, passing in a 71-20 vote in which 42 Democrats (66 percent) and 29 Republicans (81 percent) voted in favor. The bill was then sent back to the House where it passed in a 250-172 vote. In this final vote, 61 percent of House Democrats voted in favor of the bill, compared to 53 percent of Republicans, marking the only time in all four of the Civil Rights Acts that Democrats voted in favor at a higher percentage than Republicans. Brad Sylvester is a fact-check reporter for The Daily Caller News Foundation.